I attended Chelsea school of art in The early ninties, before doing what most art students do – I dropped out, leading to an open ticket to Israel. Picked up off the kotel by Jeff Sidel, like many other hapless unsuspecting youths, I was deposited in Aish HaTorah (yes, I was REALLY one of those guys!). 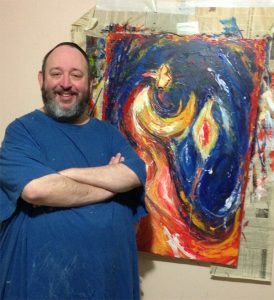 Years later I emerged, and married and found myself living in Miami, doing PR for yeshivah. That led into the heady world of web and graphic design, which I’ve inhabited for the past 15 or so years – migrating into the comic book world in recent years – and now I’m here. And you know what – why’d it take me so long to get here? Art has remained a constant throughout my life and is really the only thing I think I was ever meant to do. So be in contact, use me for what I’m best at, and let’s make something unique and wonderful that you can treasure forever. Email me at Tzvi@Lebetkin.com to talk over your ideas.